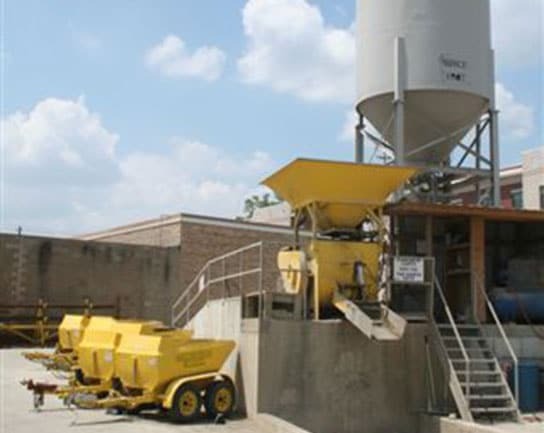 Our concrete blending system (located at 900 W. Third Ave) is capable of batching upwards of five yards of ready mix concrete per hour. The Customer using his or her own tow vehicle and one of our CBS tandem axel concrete carts can haul up to one yard of a specified mix to the job site. CBS concrete is made with premium-quality Portland type I cement and a pre-mixed sand and ¾” gravel aggregate. The blending system injects a chemical compound (retarder) into the mixer that retards setup for about two hours. We also add a chemical “air” agent that traps air bubbles in the mix which increases travel time by helping to slow the natural settling of the gravel aggregate during the towing process. At the Customer’s request the cement content can vary from a five-bag to a seven-bag mix. CBS requires the Customer to have at least a ¾ ton pickup or “full size” vehicle with a Pintle hitch or receiver hitch rated for 6,000 pounds and a 2″ ball with a 5,000 lb rating. The trailer with a yard of concrete will weigh approximately 2 ½ tons. The Customer’s vehicle must also have a tail light plug that will accept a 4-pin flat plug to actuate the brake lights on the concrete trailer. The maximum towing speed is 45 mph. The Customer should have all site preparation done before obtaining the CBS concrete and leaving our Third Ave. location. It is best to dump the concrete immediately upon arrival at the jobsite, especially in hot weather. The Customer must then thoroughly rinse and clean out the cart prior to returning it to CBS. Normal mixing hours are between 7:00AM and 3:30PM (early Spring to late Fall). If freezing temperatures exist, be sure to call first to verify availability. Trailers must be returned within two hours of leaving the CBS yard or a @25 per hour late charge will apply with one exception. If the Customer leaves within two hours of closing time, the clean trailer may be returned within the first hour of the next business morning. All trailers are for hauling concrete purchased at CBS only. No other use is authorized. A $50 refundable cleanup deposit is required on each trailer rental. After the trailer has been returned on time, inspected to be undamaged as well as clean inside and out, the deposit will be refunded. CBS does require the Customer (driver of the towing vehicle) to show proof of insurance and a valid driver’s license prior to purchase.